This Alaska cruise is a week on board a small ship - a converted expedition vessel that sleeps maximum eighty passengers. This is, of course, small in comparison with some of the giant cruise ships that travel Alaskan waters, and the size of our ship means that it can navigate the coves and crannies of this extraordinary coastline. Although large enough to navigate these icy waters and also carry zodiac boats and other equipment such as sea kayaks. This means that our guests can enjoy trips such as kayaking in Misty Fjords National Monument, taking a skiff to a waterfall for the best wake up shower ever or hiking in the exquisite environs of Baird Glacier. 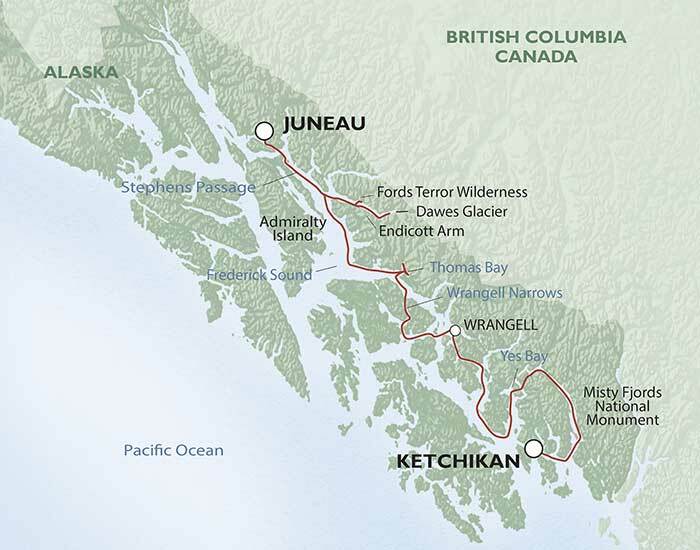 We also take some time in Wrangell, an ancient town and home to the indigenous Tlingit people, whom we meet and exchange stories with during an onboard lecture as well as at the Kiksetti Totem Park. Wildlife watching on this small ship cruise is stupendous. Watch whales breach when you least expect, eagles soaring as you soak in a hot tub, or watch bears from a safe distance as they come foraging on the shores of the Behm Canal. Combined with so many other glacial treats and a chance of Northern Lights, there is never a dull moment on this trip. Traveling by small vessels enables us to get up close to nature and wildlife in some of the most scenic areas of the world. While delivering exceptional access to these areas, we realize our presence has an impact and foster responsible practices to lessen our environmental footprint—from replacing engines for more efficient models to making arrangements in each port for recycling and proper disposal of waste. Our teams on board and ashore work together to operate responsibly. The Passenger Vessel Association (PVA) recognizes the vessels owners as a member of its Green WATERS Program for their dedication and commitment toward a cleaner, greener marine environment. Members of WATERS (We Are Taking Environmental Responsibility/Stewardship) around the U.S. have taken it upon themselves to reduce their environmental impact in a variety of ways, including reducing fuel consumption, conserving potable water, using less harmful chemicals near waterways, conserving energy, and working with their employees to create a greener workplace. A key part of operating a responsible business is ensuring we leave a positive impact in the communities we visit. This core value is part of our initial itinerary planning on through to operations management and office practices. Whether it’s a cruise donation to an organization for a fundraising effort or partnering with locals for tours, we look for ways to share the wealth and enrich the lives of those we meet. We are stewards of the lands where we travel—our teams on board and ashore work together to operate responsibly. Chefs Collaborative works with chefs and the greater food community to celebrate local foods and foster a more sustainable food supply. The Collaborative inspires action by translating information about our food into tools for making knowledgeable purchasing decisions. Through these actions, members embrace seasonality, preserve diversity and traditional practices, and support local economies. There were so many highlights. The knowledgeable guides, the fantastic staff on the boat, the food, the scenery and the wildlife. Bring clothes for hot sunshine, wet weather and the cold. Lots of layers. The education talks definitely raised awareness of conservation issue.